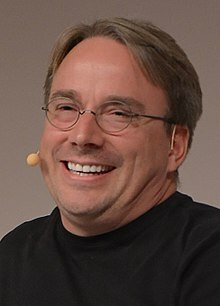 Linus Benedict Torvalds (/ˈliːnəs ˈtɔːrvɔːldz/; Finland Swedish: [ˈliːnɵs ˈtuːrvalds] ( listen); born December 28, 1969) is a Finnish–American software engineer who is the creator, and historically, the principal developer of the Linux kernel, which became the kernel for many Linux distributions and operating systems such as Android and Chrome OS. He also created the distributed version control system Git and the diving logging and planning software Subsurface. He was honored, along with Shinya Yamanaka, with the 2012 Millennium Technology Prize by the Technology Academy Finland "in recognition of his creation of a new open source operating system for computers leading to the widely used Linux kernel". He is also the recipient of the 2014 IEEE Computer Society Computer Pioneer Award and the 2018 IEEE Masaru Ibuka Consumer Electronics Award. Torvalds was born in Helsinki, Finland in 1969. He is the son of journalists Anna and Nils Torvalds, and the grandson of statistician Leo Törnqvist and of poet Ole Torvalds. Both of his parents were campus radicals at the University of Helsinki in the 1960s. His family belongs to the Swedish-speaking minority. Torvalds was named after Linus Pauling, the Nobel Prize-winning American chemist, although in the book Rebel Code: Linux and the Open Source Revolution, Torvalds is quoted as saying, "I think I was named equally for Linus the Peanuts cartoon character", noting that this makes him half "Nobel Prize-winning chemist" and half "blanket-carrying cartoon character". Torvalds attended the University of Helsinki between 1988 and 1996, graduating with a master's degree in computer science from the NODES research group. His academic career was interrupted after his first year of study when he joined the Finnish Army Uusimaa brigade, in the summer of 1989, selecting the 11-month officer training program to fulfill the mandatory military service of Finland. In the army he held the rank of Second Lieutenant, with the role of a ballistic calculation officer. Torvalds bought computer science professor Andrew Tanenbaum's book Operating Systems: Design and Implementation, in which Tanenbaum describes MINIX, an educational stripped-down version of Unix. In 1990, he resumed his university studies, and was exposed to UNIX for the first time, in the form of a DEC MicroVAX running ULTRIX. His M.Sc. thesis was titled Linux: A Portable Operating System. His interest in computers began with a Commodore VIC-20, at the age of 11 in 1981, initially programming in BASIC, but later by directly accessing the 6502 CPU in machine code. He did not make use of assembly language. After the VIC-20 he purchased a Sinclair QL, which he modified extensively, especially its operating system. "Because it was so hard to get software for it in Finland, Linus wrote his own assembler and editor (in addition to Pac-Man graphics libraries)" for the QL, as well as a few games. He wrote a Pac-Man clone named Cool Man. On January 5, 1991 he purchased an Intel 80386-based clone of IBM PC before receiving his MINIX copy, which in turn enabled him to begin work on Linux. The first prototypes of Linux were publicly released later that year (1991). Version 1.0 was released on March 14, 1994. Torvalds first encountered the GNU Project in 1991, after another Swedish-speaking computer science student, Lars Wirzenius, took him to the University of Technology to listen to free software-guru Richard Stallman's speech. Torvalds used Stallman's GNU General Public License version 2 (GPLv2) for his Linux kernel. After a visit to Transmeta in late 1996, Torvalds accepted a position at the company in California, where he would work from February 1997 until June 2003. He then moved to the Open Source Development Labs, which has since merged with the Free Standards Group to become the Linux Foundation, under whose auspices he continues to work. In June 2004, Torvalds and his family moved to Dunthorpe, Oregon, to be closer to the OSDL's Beaverton, Oregon-based headquarters. From 1997 to 1999, he was involved in 86open helping to choose the standard binary format for Linux and Unix. In 1999, he was named by the MIT Technology Review TR100 as one of the world's top 100 innovators under age 35. In 1999, Red Hat and VA Linux, both leading developers of Linux-based software, presented Torvalds with stock options in gratitude for his creation. That same year both companies went public and Torvalds's share value temporarily shot up to roughly US$20 million. His personal mascot is a penguin nicknamed Tux, which has been widely adopted by the Linux community as the mascot of the Linux kernel. Although Torvalds believes "open source is the only right way to do software", he also has said that he uses the "best tool for the job", even if that includes proprietary software. He was criticized for his use and alleged advocacy of the proprietary BitKeeper software for version control in the Linux kernel. Torvalds subsequently wrote a free-software replacement for BitKeeper called Git. In 2008, Torvalds stated that he used the Fedora distribution of Linux because it had fairly good support for the PowerPC processor architecture, which he had favored at the time. His usage of Fedora was confirmed in a later 2012 interview. He has also posted updates about his choice of desktop environment, often in response to perceived feature regressions. Currently, the Linux Foundation sponsors Torvalds so he can work full-time on improving Linux. Linus Torvalds is known for disagreeing with other developers on the Linux kernel mailing list. Calling himself a "really unpleasant person", he later explained "I'd like to be a nice person and curse less and encourage people to grow rather than telling them they are idiots. I'm sorry – I tried, it's just not in me." His attitude, which Torvalds considers necessary for making his point clear, has drawn criticism from Intel programmer Sage Sharp and systemd developer Lennart Poettering, among others. On Sunday, September 16, 2018 the Linux Kernel Code of Conflict was suddenly replaced by a new Code of Conduct based on the Contributor Covenant. Shortly thereafter, in the release notes for Linux 4.19-rc4, Linus apologized for his behavior, calling the personal attacks of the past "unprofessional and uncalled for" and announced a period of "time off" to "get some assistance on how to understand people’s emotions and respond appropriately". It soon transpired that these events followed The New Yorker approaching Linus with a series of questions critical of his conduct. Following the release of Linux 4.19 on October 22, Linus went back to maintaining the kernel. Initially, Torvalds wanted to call the kernel he developed Freax (a combination of "free", "freak", and the letter X to indicate that it is a Unix-like system), but his friend Ari Lemmke, who administered the FTP server where the kernel was first hosted for download, named Torvalds's directory linux. As of 2006, approximately two percent of the Linux kernel was written by Torvalds himself. Because thousands have contributed to the Linux kernel, this percentage is one of the largest contributions to it. However, he stated in 2012 that his own personal contribution is now mostly merging code written by others, with little programming. Torvalds retains the highest authority to decide which new code is incorporated into the standard Linux kernel. Torvalds holds the "Linux" trademark and monitors the use of it, chiefly through the Linux Mark Institute. Linus Torvalds is married to Tove Torvalds (née Monni)—a six-time Finnish national karate champion—whom he first met in late 1993. Linus was running introductory computer laboratory exercises for students and instructed the course attendees to send him an e-mail as a test, to which Tove responded with an e-mail asking for a date. Tove and Linus were later married and have three daughters, Patricia Miranda (born 1996), Daniela Yolanda (born 1998), and Celeste Amanda (born 2000), two of whom were born in the United States. The Linux kernel's reboot system call accepts their dates of birth (written in hexadecimal) as magic values. Torvalds has described himself as "completely a-religious—atheist", adding that "I find that people seem to think religion brings morals and appreciation of nature. I actually think it detracts from both. It gives people the excuse to say, 'Oh, nature was just created,' and so the act of creation is seen to be something miraculous. I appreciate the fact that, 'Wow, it's incredible that something like this could have happened in the first place.'" He later added that while in Europe religion is mostly a personal issue, in the United States it has become very politicized. When discussing the issue of church and state separation, Torvalds also said, "Yeah, it's kind of ironic that in many European countries, there is actually a kind of legal binding between the state and the state religion." However, in a story about the March LinuxWorld Conference titled "Linus the Liberator", Torvalds is quoted as saying "There are like two golden rules in life. One is 'Do unto others as you would want them to do unto you.' For some reason, people associate this with Christianity. I'm not a Christian. I'm agnostic. The other rule is 'Be proud of what you do.'" In 2010, Torvalds became a United States citizen and registered to vote in the United States. He is unaffiliated with any U.S. political party, saying, "I have way too much personal pride to want to be associated with any of them, quite frankly." Linus developed an interest in scuba diving in the early 2000s and went on to achieve numerous certifications, which later led to him creating the Subsurface project. 2018 IEEE Masaru Ibuka Consumer Electronics Award IEEE Masaru Ibuka Consumer Electronics Award is conferred by the Institute of Electrical and Electronics Engineers for outstanding contributions to consumer electronics technology has been named in honor the co-founder and honorary chairman of Sony Corporation, Masaru Ibuka. 2018 Ibuka award was conferred to Linus Torvalds "For his leadership of the development and proliferation of Linux." 2014 IEEE Computer Pioneer Award On April 23, 2014, the Institute of Electrical and Electronics Engineers named Torvalds as the 2014 recipient of the IEEE Computer Society's Computer Pioneer Award. The Computer Pioneer Award was established in 1981 by the IEEE Computer Society Board of Governors to recognize and honor the vision of those whose efforts resulted in the creation and continued vitality of the computer industry. The award is presented to outstanding individuals whose main contribution to the concepts and development of the computer field was made at least 15 years earlier. 2012 Internet Hall of Fame On April 23, 2012, at Internet Society's Global INET conference in Geneva, Switzerland, Torvalds was one of the inaugural inductees into the Internet Hall of Fame, one of ten in the Innovators category and thirty-three overall inductees. 2012 Millennium Technology Prize On April 20, 2012, Torvalds was declared one of two winners of that year's Millennium Technology Prize, along with Shinya Yamanaka. The honor is widely described as technology's equivalent of the Nobel Prize. 2010 C&C Prize He was awarded the C&C Prize by the NEC Corporation in 2010 for "contributions to the advancement of the information technology industry, education, research, and the improvement of our lives". 2008 Hall of Fellows In 2008, he was inducted into the Hall of Fellows of the Computer History Museum in Mountain View, California, "for the creation of the Linux kernel and the management of open source development of the widely used Linux operating system." 2005 Vollum Award In August 2005, Torvalds received the Vollum Award from Reed College. 2003 Linus (Moon) In 2003, the naming of the asteroid moon Linus was motivated in part by the fact that the discoverer was an enthusiastic Linux user. Although the naming proposal referred to the mythological Linus, son of the muse Calliope and the inventor of melody and rhythm, the name was also meant to honor Linus Torvalds, and Linus van Pelt, a character in the Peanuts comic strip. 2001 Takeda Award In 2001, he shared the Takeda Award for Social/Economic Well-Being with Richard Stallman and Ken Sakamura. 2000 Lovelace Medal In 2000, he was awarded the Lovelace Medal from the British Computer Society. 1998 EFF Pioneer Award In 1998, Torvalds received an EFF Pioneer Award. 1997 Academic Honors In 1997, Torvalds received his master's degree (Laudatur Grade) from the Department of Computer Science at the University of Helsinki. Two years later he received honorary doctor status at Stockholm University, and in 2000, he received the same honor from his alma mater. University of Helsinki has named an auditorium after Torvalds and his computer is on display at the Department of Computer Science. 1996 9793 Torvalds (Asteroid) In 1996, the asteroid 9793 Torvalds was named after him. 1995 Running Linux on AlphaStation In the period 1994–1999 Torvalds developed versions of Linux on early AlphaServer systems made available to him by the engineering department of Digital Equipment Corporation. Compaq software engineers developed special Linux kernel modules. Linux distributions that ran on AlphaServer systems were Red Hat 7.2. and Gentoo Linux. In 2000, he was 17th in their Time 100: The Most Important People of the Century poll. In 2004, he was named one of the most influential people in the world by Time magazine. In 2006, the magazine's Europe edition named him one of the revolutionary heroes of the past 60 years. InfoWorld presented him with the 2000 Award for Industry Achievement. In 2005, Torvalds appeared as one of "the best managers" in a survey by BusinessWeek. In 2006, Business 2.0 magazine named him one of "10 people who don't matter" because the growth of Linux has shrunk Torvalds's individual impact. In summer 2004, viewers of YLE (the Finnish Broadcasting Company) placed Torvalds 16th in the network's 100 Greatest Finns. In 2010, as part of a series called The Britannica Guide to the World's Most Influential People, Torvalds was listed among The 100 Most Influential Inventors of All Time (ISBN 9781615300037). On October 11, 2017, the Linux company SUSE made a song titled "Linus Said". Himanen, Pekka: The Hacker Ethic and the Spirit of the Information Age. Prologue: Linus Torvalds, the epilogue: Manuel Castells. Random House, 2001. ISBN 951-0-25417-7. Moody, Glyn: Rebel Code. Engl. the beginning of work: Rebel Code. Eng. Riikka Toivanen and Heikki Karjalainen. In January, 2001. ISBN 951-31-2003-1. Nikkanen, Tuula: The Linux story. Satku, 2000. ISBN 951-762-990-7. ^ a b Rogoway, Mike (June 7, 2005). "Linus Torvalds, Incognito Inventor". The Oregonian. Archived from the original on July 9, 2014. Retrieved July 8, 2014. A sort of anti-celebrity, he is plainly ambivalent about fame and content to stay nestled at home in a tony cluster of million-dollar houses atop the densely forested hills of the Dunthorpe neighborhood. ^ a b "Citizen Linus". LWN.net. September 13, 2010. ^ "Linus Torvalds 2008 Fellow". Archived from the original on July 9, 2010. ^ a b "Linux Online – Linus Torvalds Bio". Linux.org. Archived from the original on June 26, 2004. Retrieved March 13, 2010. ^ a b c Rogoway, Mike (September 14, 2010). "Linus Torvalds, already an Oregonian, now a U.S. citizen". The Oregonian. Retrieved September 16, 2010. ^ "Technology Academy Finland – Stem cell pioneer and open source software engineer are 2012 Millennium Technology Prize laureates". Technologyacademy.fi. April 19, 2012. Archived from the original on January 17, 2014. Retrieved April 24, 2012. ^ a b "List of IEEE Masaru Ibuka Consumer Electronics Award recipients" (PDF). ieee.org. April 3, 2017. Archived from the original (PDF) on March 28, 2018. ^ a b c Moody, Glyn (2002). Rebel Code: Linux and the Open Source Revolution. Perseus Books Group. p. 336. ISBN 0-7382-0670-9. Archived from the original on April 11, 2013. ^ Torvalds & Diamond 2001, p. 38, 94. ^ "NODES research group". Cs.helsinki.fi. October 16, 2008. Retrieved March 13, 2010. ^ "Staff". The Linux Foundation. Archived from the original on April 19, 2009. Retrieved April 24, 2012. ^ Linus Torvalds, David Rusling (September 30, 2016). LAS16-500K3: Fireside Chat with David Rusling and Linus Torvalds. 24:10: Linaro. Retrieved October 8, 2016. ^ Ko, Ellen (September 27, 2010). "Geek Time with Linus Torvalds". Google. Retrieved November 8, 2015. ^ Torvalds, Linus: GMOVE. Program listing. In MikroBitti 11/1986, p. 63. ^ "Linux News". Abc.se. January 5, 1991. Retrieved March 13, 2010. ^ Torvalds, Linus Benedict (August 25, 1991). "What would you like to see most in minix?". Newsgroup: comp.os.minix. Usenet: 1991Aug25.205708.9541@klaava.Helsinki.FI. I'm doing a (free) operating system (just a hobby, won't be big and professional like gnu) for 386(486) AT clones. ^ "Kernel 1.0 Source Code Release". Retrieved October 27, 2008. ^ "1999 Young Innovators Under 35: Linus Torvalds, 29". Technology Review. 1999. Archived from the original on March 29, 2011. Retrieved August 14, 2011. ^ a b Gumbel, Peter (November 13, 2006). "Linus Torvalds". Time. Archived from the original on September 30, 2009. Retrieved March 13, 2010. ^ Rivlin, Gary. "Leader of the Free World". Wired. Retrieved June 14, 2008. ^ a b "Linus Torvalds: A Very Brief and Completely Unauthorized Biography". The Linux Information Project. Bellevue Linux Users Group. January 24, 2006. Retrieved October 22, 2010. ^ Torvalds, Linus (May 9, 1996). "Re: Linux Logo prototype". Archived from the original on May 30, 2012. ^ Morris, Richard (July 17, 2008). "Linus Torvalds, Geek of the Week". Archived from the original on January 10, 2010. Retrieved August 3, 2009. ^ "Interview with Linus Torvalds from Linux Format 163". TuxRadar. Linux Format. November 29, 2012. Archived from the original on January 19, 2014. Retrieved February 3, 2014. ^ "About Us". The Linux Foundation. Retrieved June 19, 2013. ^ Vance, Ashlee (June 16, 2015). "The Creator of Linux on the Future Without Him". Bloomberg. ^ Sharwood, Simon (January 19, 2015). "Buggy? Angry? LET IT ALL OUT says Linus Torvalds". The Register. Retrieved November 8, 2015. ^ Clarke, Gavin (November 7, 2012). "Torvalds: I want to be nice, and curse less, but it's just not in me". The Register. Retrieved November 8, 2015. ^ "Lennart Poettering: Open Source Community "Quite A Sick Place To Be In"". Slashdot. October 6, 2014. Retrieved November 8, 2015. ^ Gold, Jon (October 5, 2015). "Linux kernel dev Sarah Sharp quits, citing 'brutal' communications style". Network World. Retrieved November 8, 2015. ^ "Linux 4.19-rc4 released, an apology, and a maintainership note". September 16, 2018. ^ Corbet, Jonathan (September 18, 2018). "Code, conflict, and conduct". LWN.net. ^ Cohen, Noam (September 19, 2018). "After Years of Abusive E-mails, the Creator of Linux Steps Aside". New York, USA: The New Yorker. ISSN 0028-792X. ^ Corbet, Jonathan (October 22, 2018). "The 4.19 kernel is out". LWN.net. ^ Moody, Glen. "The Greatest OS That (Never) Was". Wired. Retrieved July 22, 2013. ^ "An Interview With Linus Torvalds". Tech Crunch. April 19, 2012. Retrieved April 22, 2012. ^ Ingo, Henrik (2005). Open Life: The Philosophy of Open Source (PDF) (Online version). Ingram. pp. 42–45. ^ "Linus Explains Linux Trademark Issues". Slashdot.org. Retrieved March 13, 2010. ^ "Linus Torvalds' bio". Nndb.com. Retrieved March 13, 2010. ^ Torvalds, Linus. "index : kernel/git/torvalds/linux.git". Linux kernel. Retrieved May 30, 2013. ^ "Debian's reboot(2) man page". Retrieved August 16, 2011. ^ Richardson, Marjorie (November 1, 1999). "Interview: Linus Torvalds". Linux Journal. Retrieved April 2, 2011. ^ David Diamond. "Linus the Liberator". SiliconValley.com. Archived from the original on January 27, 2001. ^ "Divelog.blue Interviews: Linus Tovalds". Divelog.blue. Retrieved July 1, 2018. ^ "Linus Torvalds Named Recipient of the 2014 IEEE Computer Society Computer Pioneer Award". Institute of Electrical and Electronics Engineers. April 23, 2014. Retrieved May 5, 2014. ^ "2012 Internet Hall of Fame inductees 2012". Internet Hall of Fame. Retrieved April 24, 2012. ^ "Linus Torvalds wins the tech. equivalent of a Nobel Prize: the Millennium Technology Prize". ZDNet. April 19, 2012. Retrieved April 24, 2012. ^ "Yamanaka wins Finnish award for iPS work : National : DAILY YOMIURI ONLINE (The Daily Yomiuri)". Yomiuri Shimbun. Japan. April 21, 2012. Archived from the original on April 22, 2012. ^ von Eitzen, Chris (October 21, 2010). "Linus Torvalds awarded 2010 C&C Prize". The H. Heinz Heise. Archived from the original on October 24, 2010. Retrieved October 22, 2010. ^ "The Computer History Museum Announces the 2008 Fellow Awards Recipients" (Press release). Computer History Museum. June 18, 2008. Retrieved October 22, 2010. ^ "Fellow Awards: Linus Torvalds". Computer History Museum. October 21, 2008. Archived from the original on July 9, 2010. Retrieved October 22, 2010. ^ "Linux creator Linus Torvalds honored with Reed College's Vollum Award". Web.reed.edu. August 24, 2005. Retrieved March 13, 2010. ^ Margot, Jean-Luc (2004). "Adaptive Optics Observations of Kalliope-Linus". UCLA. Retrieved August 30, 2013. ^ "Talking to Torvalds". British Computer Society. September 2007. ^ "Torvalds, Stallman, Simons Win 1998 Pioneer Awards". W2.eff.org. Archived from the original on October 7, 2010. Retrieved March 13, 2010. ^ "9793 Torvalds (1996 BW4)". Retrieved September 4, 2013. ^ "Compaq Offers Linux-ready ProLiant Servers, AlphaServers and Professional Workstations". www.informatica.co.cr. Retrieved May 27, 2016. ^ "Red Hat Announces Port of Red Hat Linux 7.2 to Compaq's Alpha Processors". www.informatica.co.cr. Retrieved January 8, 2002. ^ "The 2010 Time 100". Time. Archived from the original on January 3, 2007. Retrieved May 7, 2010. ^ Lessig, Lawrence (April 26, 2004). "Linus Torvalds: The Free-Software Champion". Time magazine. Retrieved October 3, 2006. ^ Nicholas Petreley (January 17, 2000). "This year's Award for Industry Achievement goes to the creator of Linux, Linus Torvalds". InfoWorld. p. 82. ^ "The Best & Worst Managers Of The Year". Bloomberg BusinessWeek. January 10, 2005. Archived from the original on January 1, 2005. Retrieved March 13, 2010. ^ Business 2.0 Magazine staff (June 22, 2006). "10 people who don't matter". CNN. Retrieved March 13, 2010. ^ "Linus Torvalds named one of the 100 most influential inventors". The H. February 4, 2010. Archived from the original on February 8, 2010. Retrieved February 15, 2010. ^ * Loney, Matt (April 10, 2001). "Exclusive: Linus Torvalds tells his story". ZDNet. Retrieved August 9, 2017. Wayner, Peter (May 1, 2001). "Just for Fun, by Linus Torvalds and David Diamond; Rebel Code, by Glyn Moody". Wired. Retrieved August 9, 2017. Himanen, Pekka; Torvalds, Linus; Castells, Manuel (2001). The Hacker Ethic. Secker & Warburg. ISBN 0-436-20550-5. Young, Robert (March 1994). "Interview with Linus, the Author of Linux". Linux Journal (#1).